We’ve spent the past few days in the most beautiful place in the Sunshine State, Big Pine Key. And lobster is on the menu. Most nights we eat them split in half and grilled. It’s so easy and tasty. 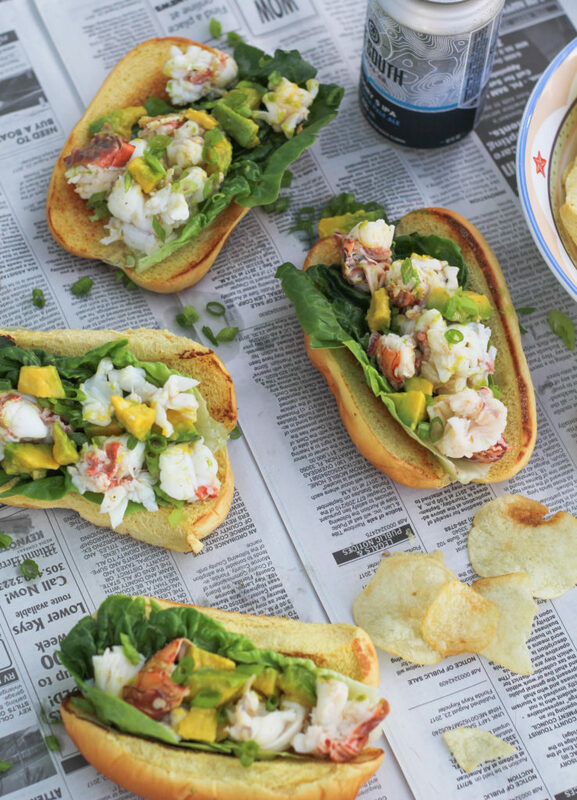 But with New England summer fare fresh on my mind, I decided to reinvent the classic lobster roll in Florida fashion. Toby’s Aunt Liz makes the best lobster rolls I’ve had. She gets the lobster meat from her neighborhood lobsterman, who will cook it, pick it, and deliver it to her door. Just the sight of that giant bag filled with big fat chunks of lobster meat makes my heart go pitter-patter. 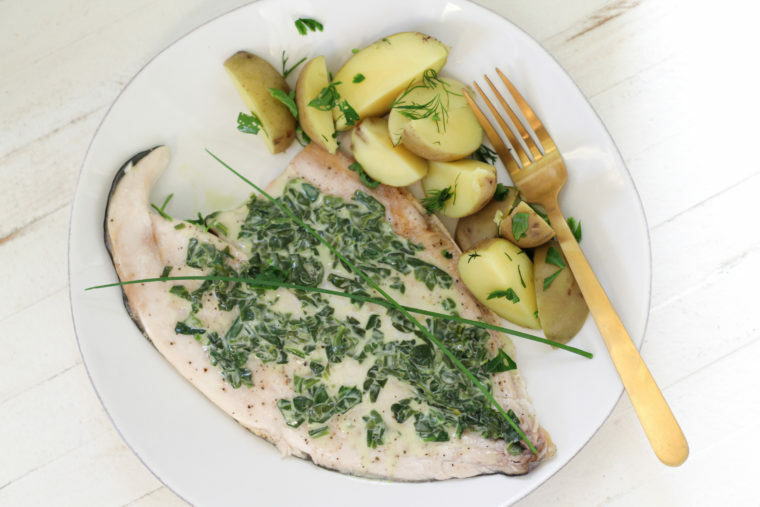 All she’s left to do is whip up her amazing lemon aïoli (nope, not mayo). 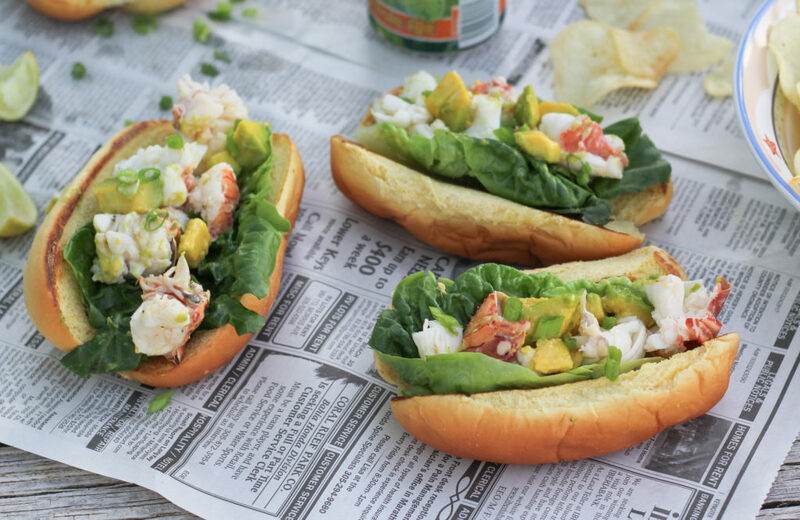 She tosses it with the lobster meat and tucks it into rolls lined with lettuce leaves. She also serves a few extras as lettuce wraps. Eaten on the porch with a view of Lanes Cove, that’s what New England summer dreams are made of. Unfortunately, I do not have a lobsterman who will deliver bags of cooked lobster meat to my door. That would be amazing, wouldn’t it? 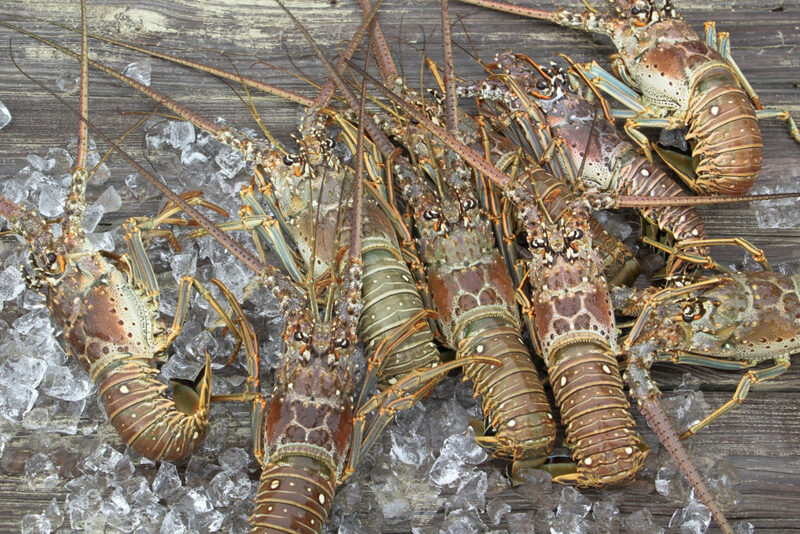 But then again, when it comes to Florida lobsters, catching them is half the fun. I love snorkeling around looking for hideouts and antennas. 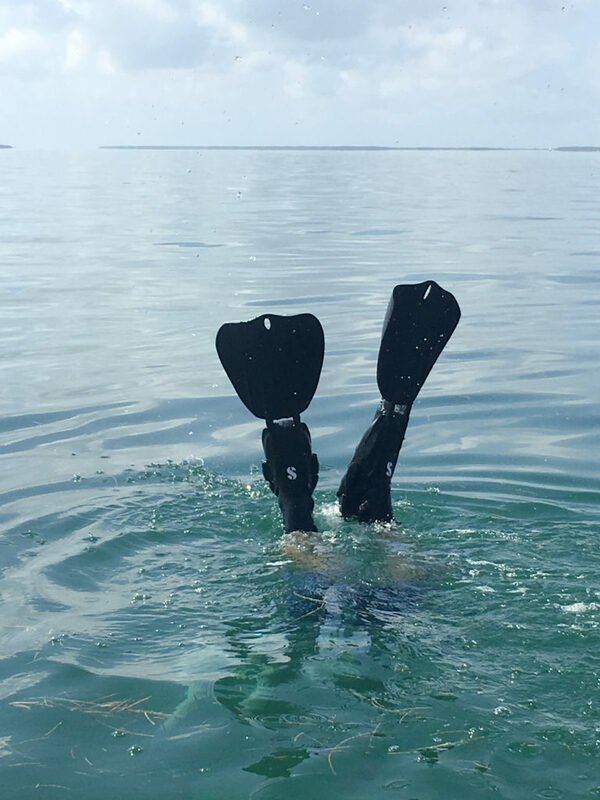 There’s so much to see along the way, especially in the clear water of the Florida Keys. We spotted a few Moray eels and lots of sea turtles over the past few days, and countless schools of tropical fish. And, yes, we scooped up some lobsters along the way. So here’s how we make a Florida-style lobster roll: Crack open the shells with kitchen shears, pull out the meat and slice it into chunks. Poach the lobster meat. Whip up some aïoli, made with fresh Florida key limes, naturally. 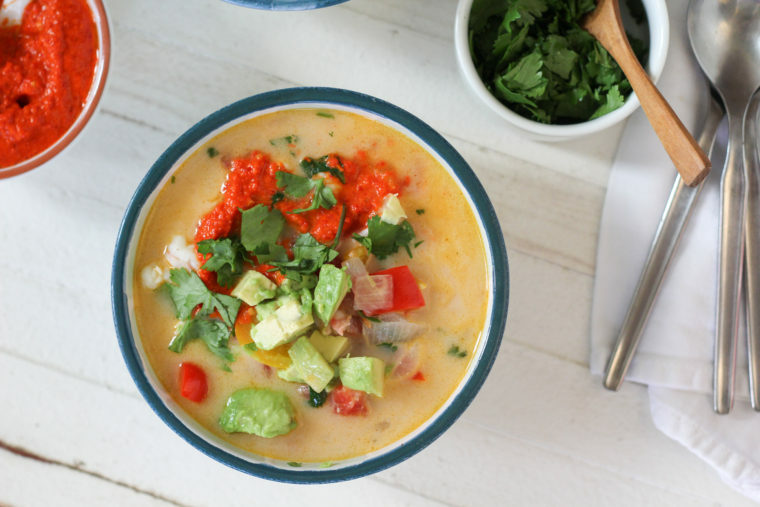 Drizzle it over the lobster meat and gently toss it with diced avocado. Now get some squishy hot dog rolls nice and toasty in a skillet. 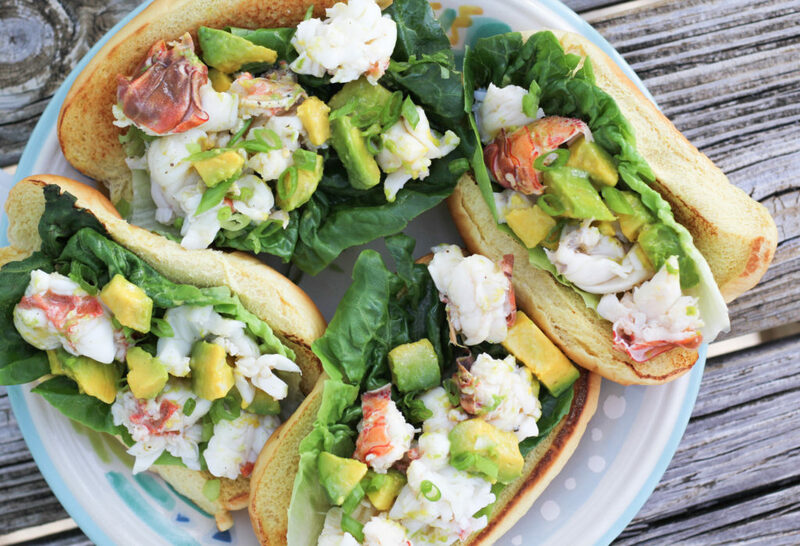 Line them with crisp lettuce leaves and pile them high with lobster and avocado. Sprinkle on a bit of sliced scallions. 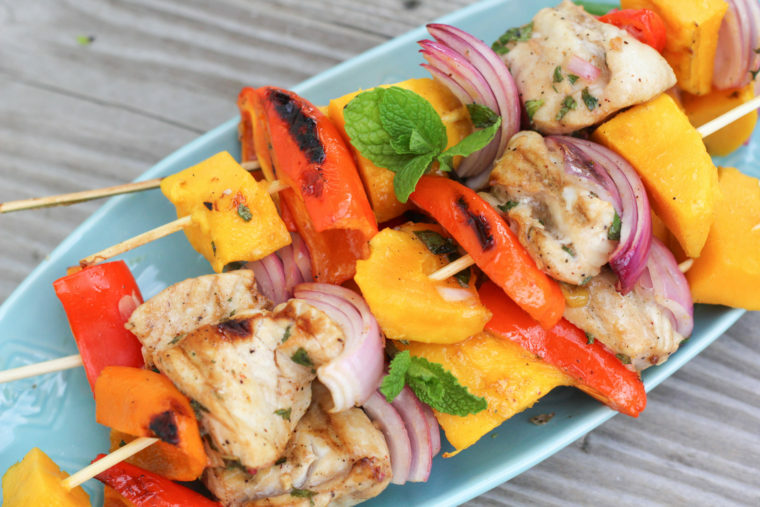 Serve them on the porch, along with potato chips and cold beer. That’s what Big Pine Key dreams are made of. Bring 3 quarts of water to a boil with crushed whole garlic cloves, peppercorns, scallion ends and bay leaves. Squeeze each key lime half into the pot and drop it in. Allow it to boil for 10 minutes. Insert kitchen shears between the lobster meat and shell and slice through the shell lengthwise on both sides, then snip through the meat to split in half. Pull out the meat. Slice it into 1 1/2-inch chunks. 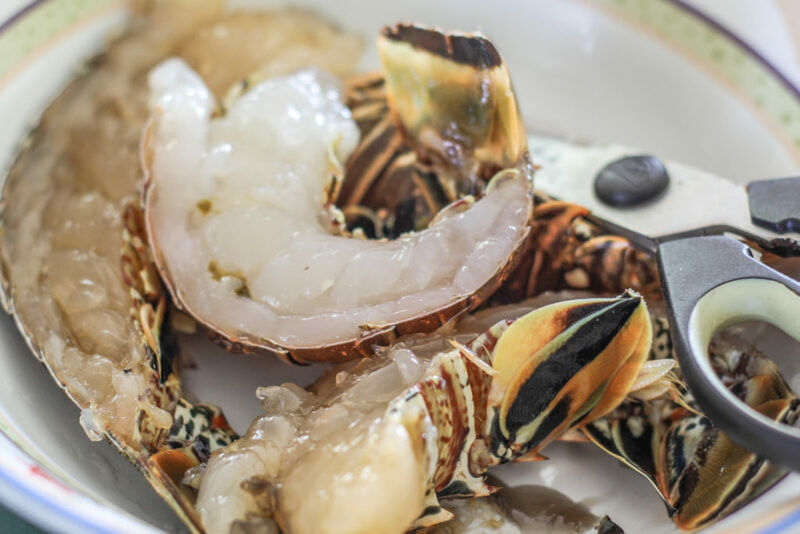 Drop the lobster chunks into the water and poach for 90 seconds. Remove with a slotted spoon and transfer to a bowl. Rinse with cool water, drain, and set aside. Mince and mash the garlic with a pinch of salt and whisk into the aïoli. Taste and season with salt and pepper and a few drops of hot sauce, if you like. Toss the lobster meat with aïoli, then gently fold in the avocado. Melt butter in a large skillet over medium. Split open the hot dog buns and toast the inside until golden and then flip over and toast very lightly on the outside. 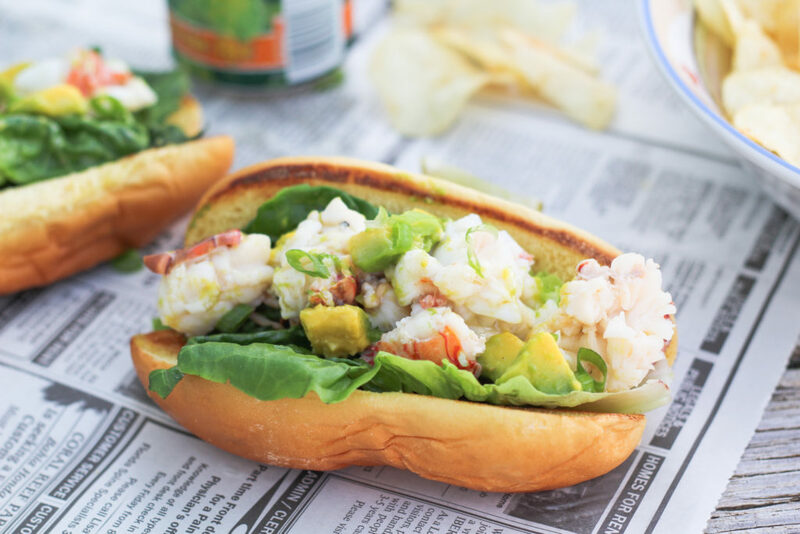 Line each hot dog bun with lettuce leaves and fill with as much lobster salad as possible. Sprinkle on the sliced scallions and serve. Did you save the poaching liquid? I didn’t! But it smelled really good. What should I do with it next time? What a great post! Love the idea of lobster chunks delivered, oh my! 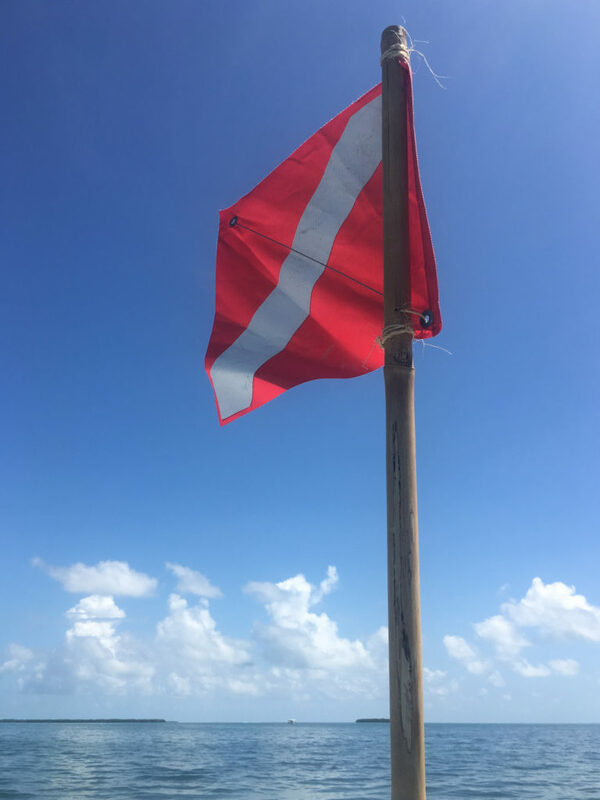 I’ve really enjoyed all your Big Pine Key videos and pics on IG as well. 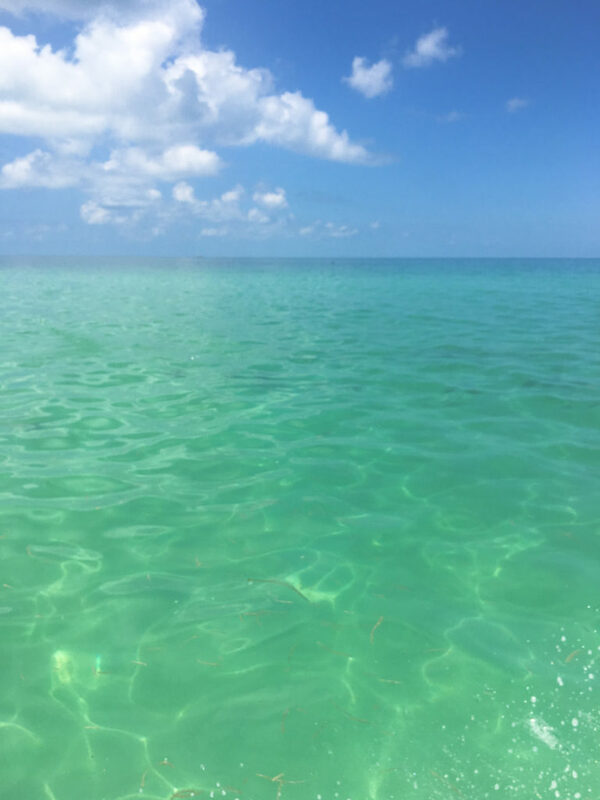 We need to get back down to the Keys! Yes, you and Phil should definitely visit soon! And bring your sketchbook! Ooh, these look SO good! As a New Englander myself, I can attest to the deliciousness of a fresh lobster roll, with all its simplicity, including that all-necessary butter-toasted split top bun!, but your Florida version looks wonderful. Toby insists on the butter-toasted buns, too. The only thing I really miss with this Florida version is claw meat. I could LIVE on claw meat.